This page should provide you with all the information required about travelling to your expedition destination. Voyages to the Antarctic Peninsula depart from South America and depending on the exact itinerary of your expedition, your ship will embark in either Argentina or Chile. A handful of voyages will also use the port of Montevideo in Uruguay. Inside Chile and Argentina there are a number of ports which the vessels utilise for these expeditions. You will need to firstly arrive in either Santiago or Buenos Aires and we would suggesting arriving to the capital city a few days early. This will allow your safe arrival and to overcome any jet lag. If your voyage is departing from Ushuaia, Argentina or Punta Arenas you will need to connect on a local carrier to these destinations. Our transfer & hotel recommendations are offered as a guide only and price is subject to change. iExpedition do not book transfers or hotels. Briefing Cruise Visitors from IAATO on Vimeo. Briefing Visitors Going Ashore from IAATO on Vimeo. Fly-in & Deep field visitors from IAATO on Vimeo. Please consult your local embassy for visa requirements to South America, mainly Chile and Argentina. Visa requirements are constantly changing so please ensure you have checked with your local consulate as to the correct requirements for your nationality. You must also ensure that your passport has a validity of more than six months from the day you intend to return home. Travel insurance inclusive of medical repatriation is mandatory across all bookings with iExpedition. Due to the uniqueness of the trips offered by iExpedition and the remote locations they explore, it is important that you discuss your expedition in detail with your preferred provider. At this point it is imperative that you discuss, the region’s your trip will take you and any pre-existing conditions you may have. It is a mandatory requirement of all our providers that you are covered at a high level for medical and emergency repatriation from remote and/or Polar regions. Should you be confirming a trip more than 365 days in advance, you may need to consider an insurance provider, which provides policies 18 months in advance. Alternatively, deposit/cancellation insurance is worth considering. iExpedition recommends the following insurance providers around the world. Base Layer This is the layer closest to your skin and what will ultimately keep you from feeling cold. We recommend capilene or merino wool thermal underwear and heavy wool socks. Insulation Layer The insulation layer traps the heat generated by your thermals, so is extremely important. Loft garments are an excellent choice, alternatively items such as polar fleece are also very effective. Outer Layer This layer is what protects you from the environment and includes; boot, waterproof pants, jacket and gloves. Expedition Jacket Some expedition operators will provide you with an expedition jacket. Regardless of this, we suggest you always travel with a good Goretex waterproof outer. If you are required to provide a jacket, a good quality Goretex style jacket with hood is best, that will allow you to layer appropriately underneath. Waterproof Pants These need to be a waterproof shell with a loose fitting leg, to go over your boots. Waterproof Gloves & Mittens Waterproof gloves and mittens are essential. We would certainly recommend gloves with individual fingers, as you will need to be holding on to the Zodiac and for ease of taking photos. Thermal Underwear Good quality capilene or merino wool is best. Polar Fleece Jacket A polar fleece or woolen jumper is great to have on under your outer waterproof layer. Woolen Sweaters A woolen sweater is great underneath your expedition jacket, as you may like to take your heavy expedition jacket off when you reach the shore. Warm trousers You will want to have a pair of loose fitting trousers to wear underneath your waterproof pants. Inner soles Not essential, but inner soles, merino if possible will add comfort to your expedition boots. Socks Merino socks are best as they will keep your feet warm if they should get wet. Headgear Beanies, scarfs and neck gaiters are a must! Earplugs These are very handy if you are a single traveller and do not know who your cabin might may be. Ski pole/ walking stick You are welcome to travel with these, just make sure that they are collapsible type so that they can be easily packed away when travelling on Zodiacs. Waterproof bag A waterproof bag with a shoulder strap is very important for you shore landings to protect your camera equipment and keep your hands free to hold on. As Ushuaia is a popular ski village during the winter months, it is well equipped with ski hire shops. During the summer months, these shops hire out gear for the Antarctic expeditions. If you are going to hire gear we would strongly recommend arriving a day or two early. These shops are also very handy if you have forgotten to bring something with you. 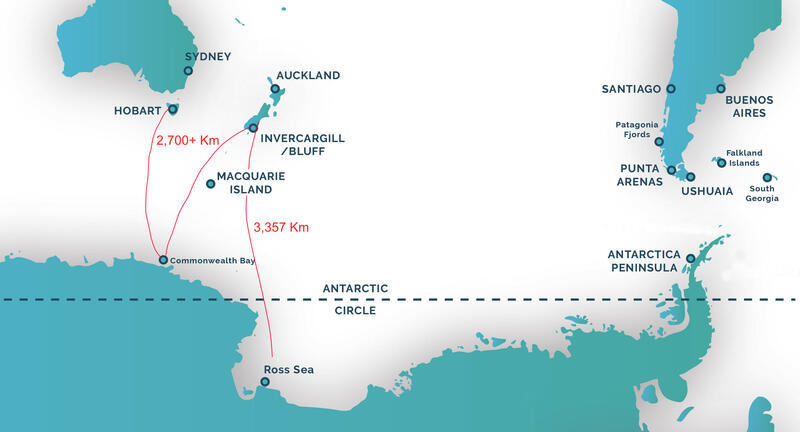 Voyages to the Ross Sea & Commonwealth Bay depart from Australia and New Zealand. Please consult your local embassy for visa requirements to Australia and New Zealand. Visa requirements are constantly changing so please ensure you have checked with your local consulate as to the correct requirements for your nationality. You must also ensure that your passport has a validity of more than six months from the day you intend to return home. All passengers, including Australian and New Zealand citizens must travel with their passports on these expeditions. Voyages to the European Arctic depart from a number of European countries depending on your expedition itinerary. The majority of voyages will depart from Longyearbyen, Svalbard or Reykjavik, Iceland, however other voyages depart from Aberdeen, Scotland and Bergen, Norway. Voyages to the North Pole on board the 50 Years of Victory depart from Murmansk, Russia. You will need to arrive into any of the major European hubs, before connecting through to your embarkation point. We certainly recommend arriving at your embarkation point the day prior to your scheduled embarkation, however, you can arrive on the day if you are pressed for time. Please consult your local embassy for visa requirements around your expedition. European Arctic voyages travel in Scotland, Norway, Greenland, Iceland, Canada and in particular Russia. Visa requirements are constantly changing so please ensure you have checked with your local consulate as to the correct requirements for your nationality. RUSSIAN VISA: Should you be travelling on a trip into Russian territories, please be sure to thoroughly check all visa requirements with your iExpedition consultant. 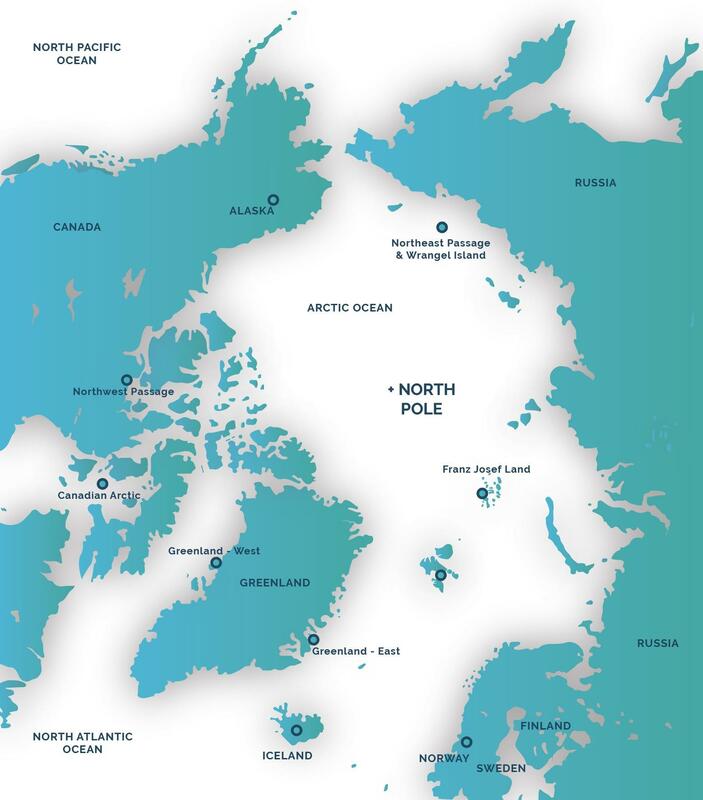 Voyages to the Canadian Arctic use remote ports, it is for this reason that all Canadian Arctic voyages require mandatory charter flights to arrive at the port. When considering these voyages, please do consider that charter rates are additional to the cost of the voyage and in some instances Canadian GST is payable. Our operators in this region use Edmonton, Ottawa and Montreal as their hubs. You will need to arrive in Edmonton, Ottawa or Montreal on day 1 of your expedition, as this will be a pre-cruise briefing day. The group will gather at the hotel provided by the ship and the following day travel together on the charter flight to meet the vessel at its location. While hotel recommendations are provided, please do note that the evening on Day 1 of your expedition is at the specified cruise hotel. If you are arriving early, you may like to refrain from booking your hotel until the cruise is hotel is confirmed.